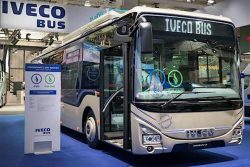 IVECO is displaying multiple natural gas powered vehicles as part of its sustainable solutions range at IAA in Hannover this week. Their offering is described as covering the requirements of every business and every mission. It includes many award-winning vehicles, such as the Daily Blue Power ‘Van of the Year’ 2018, the Crossway LE NP ‘Sustainable Bus of the Year’ 2018 and the Stralis NP 460 ‘Low Carbon Truck of the Year’’ 2018. IVECO is making history at the 67th edition of the IAA Commercial Vehicles (IAA), the most important international event in the commercial vehicle industry. It is showcasing its full commercial offering of alternative traction vehicles on a 100% Diesel Free indoor stand, creating a Low Emission Area at the exhibition. It is also hosting a dedicated Round Table focused on “The energy transition towards a sustainable future” and workshop events in collaboration with industry experts, customers and technical partners, to discuss the energy transition and related topics. Also present on the stand, and speaking at the press conference, is global energy supplier Shell, which shares IVECO’s belief that de-carbonisation of the transport sector requires a range of fuels and technologies. As part of their collaboration with the brand to promote the development of the electric and natural gas refuelling networks in Germany, Shell is also displaying on the stand a CNG/LNG filling station and an electric charging station. IVECO sees natural gas as a key energy source which provides a mature solution for sustainable transport of people and goods. Through its display and workshops, IVECO is highlighting the considerable environmental advantage of natural gas, which is able to deliver massive reductions in the most polluting emissions: 90% for NO2, 99% for particulate matter, 10% for CO2 with natural gas which rises as high as 95% with biomethane well to wheel. A circular economy based on the generation of energy from organic or agricultural waste is possible with biomethane. This can be done at an organic waste treatment centre, which generates natural gas and fertiliser from door-to-door collection, green waste, institutional catering and municipal waste. This approach can be taken even further, when methane is generated in a biodigester on a farm, using crops and agricultural waste. As they grow, the crops absorb CO2 and convert it into carbohydrates, fixing the Carbon and releasing Oxygen into the atmosphere. In the farm’s biodigester, the crop residues decompose through an anaerobic digestion process, producing biogas. This is purified into biomethane, which can be transported to filling stations and used to fuel natural gas powered vehicles for goods transport. Visitors to the IVECO stand will be able to see that this circular economy is already a reality, with the examples of the city of Lille, which operates a fleet of IVECO CNG buses fuelled with biomethane generated from municipal waste; the project led by Pot au Pin, Air Liquide and Carrefour based on biomethane from agricultural waste; and the opening of the world’s largest biogas plant in Norway by Biokraft. Through its presence at the exhibition, IVECO aims to promote the use of sustainable technologies. In addition to the vehicle display itself and the various events it is hosting, it has dedicated an Educational Area on the stand to informative panels and videos on four key themes: ‘Gas and biogas – the sustainable transport solution today and tomorrow’; ‘Our contribution to CO2 reduction’; ‘Sustainable solutions for fleet management’ in collaboration with technological partner Michelin; and ‘TCO, efficiency and productivity’. The models on display showcase the wide variety of missions the Daily Blue Power family can cover with its extensive offering: a chassis cab equipped with a Lecapitaine refrigerated box for the rental fleet of Le Petit Forestier, the European leader in refrigeration rental; a 7 tonne chassis cab equipped with a Junge platform and curtainsider; a chassis cab equipped by Fassi with a Maxicargo tipper trailer and crane for Ville de Paris; a van equipped with a Kerstner deep cooling fridge in the 40th Anniversary Limited Edition livery and a van equipped for parcel deliveries by Spier with a personalisation designed by Garage Italia Custom to commemorate the Daily’s anniversary. The second model on display is the result of IVECO’s collaboration with a technological partner to address the emissions of both truck and body: it is equipped with a sweeper body developed by Johnston Engineering that combines the truck’s CNG engine with a hydrostatic transmission, achieving a dramatic reduction in emissions – see NGV Global article here. For long-distance missions, IVECO’s solution is LNG technology. In this sector, it leads the way with the Stralis NP, the first natural gas truck specifically designed for long-haul transport on the market, and in particular with the Stralis NP 460, which last December was elected Low Carbon Truck of the Year in the UK. IVECO is showcasing this offering with models in articulated and rigid versions, including AD and low tractor trucks. Also in this sector, IVECO is presenting another industry first resulting from an important partnership: the unique 400 hp Stralis X-Way Natural Power equipped with a CIFA electric concrete mixer that offers a 100% zero Diesel, zero oil solution. The truck runs on bioCNG and is equipped with the Energya hybrid plug-in concrete mixer developed by CIFA. The mixer is operated by an electric engine powered by a lithium battery. It also features a Kinetic Energy Recovery System that recovers the truck’s energy when it is decelerating. The other Stralis NP models on the stand include the first 460 hp LNG truck for swap body missions equipped by SDG / Spier for Fraikin’s rental fleet; the first 6×2 LNG tractor with 750 km autonomy, a 4×2 LNG tractor with 1,600 km autonomy, and a low tractor in LNG version with 1,150 km autonomy. All the vehicles on display in the 100% Diesel Free – Low Emissions Area are a tangible demonstration that IVECO and its partners are delivering on the promise to deliver sustainable transport and solutions.